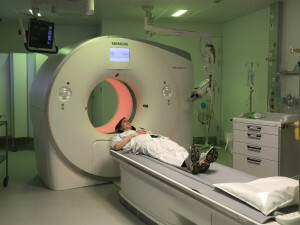 Esbjerg Hospital has – as the first hospital in Scandinavia – a completely new type of scanner. It completes a total body scan by new, lower dosage of X-rays. In order to give the patient a good experience, the hospital has installed the special lighting Ergonomic Lighting. The colored light helps to create a relaxing atmosphere and reassures the patient, tell the staff. ”Children find the colored light very cool and in generel does the light have an relaxing effect on our patients, whom are often very nervous before a scan. The coloured light take the clinical out of the process,” explains radiography Dorthe Bruun Vestergaard. Staff can choose from various light settings and colors. ” I often choose a pink light because it gives a warm and calm atmosphere in the room. 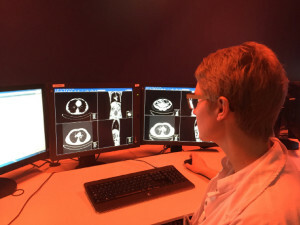 Some children would like a colored light because it gets them to think about something other than the scan,” says radiography Anette Gadegård Andersen. Besides calming down patients Ergonomic Lighting also have a number of benefits for the working environment at the hospital. 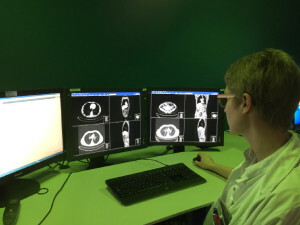 Next to the scanner room is a description room where X-ray and scan images are examined and described by radiologists. They often sit long hours in front of the screen. “The digital images are very hard on the eyes to look at a whole day. Therefore, the lighting means very much. 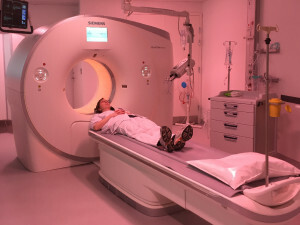 There should be no reflections and glare from the lights,” explains chief physician, radiologist, Dorthe Ulrik Knudsen. In the description room the green light setting is often selected. The color green is the contrast of the image, and makes the image clearer, while reflections are minimized. This results in less tension in the eyes, less stress and fatigue and increased concentration of the staff.